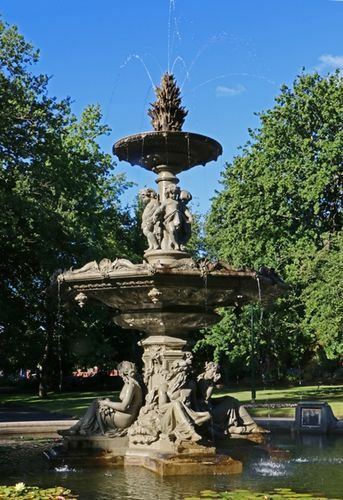 The Val d'Osne fountain was erected to commemorate the opening of Launceston's reticulated water supply. It is a bronze copy of the original and was officially turned on in 1859. The 7 metre high, 4 basin fountain features statues of Neptune, Galatea, Amphitrite and Asis on the lower tier and 4 sea nymphs holding hands on the upper tier. There are 43 water jets in total. An Historical Engineering Marker which was placed on the fountain in 2007 also commemorates this event. In 1857 Launceston's fledgling municipal council constructed its first reticulated water supply which still serves the city centre. Director of Public Works W. R. Falconer designed the gravity scheme, consisting of a weir, water race and tunnel diverting flow from the St Patricks River into a dam on Distillery Creek. Cast iron pipes delivered the water to brick reservoirs in the town. This fountain was erected to celebrate the opening. By 1860 the town had drinking fountains, fire brigades and work on a sewerage scheme had begun.